I finished Christmas shopping last night! It’s so hard to get done when I normally just pack the three kids to the store with me, and honestly, I don’t really like shopping anyhow. I had to make a special trip after they were in bed, and the thing is, I forgot most of the stores in town close around 6 pm! My only choices for shopping were literally KMart, WalMart, and Dollar Tree. There’s no mall and no Target within hours of me and all the locally-owned stores were closed. Some things I’m just not used to in small town living, and that early store closing is the worst one. Today I need to finish up all my letters, neighbor gifts, and wrapping. It’s almost nice that Christmas is so soon because all these things looming over my head just have to get done. I love a deadline. Here’s that recipe I shared over at Honey Bear Lane at the beginning of the month. 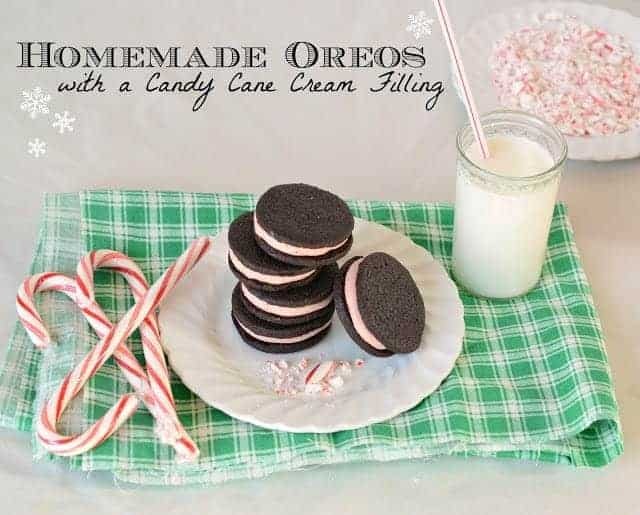 It’d be a good one to make for Santa! Rumor has it the man loves him some mint Oreos. What does Santa get at your house? 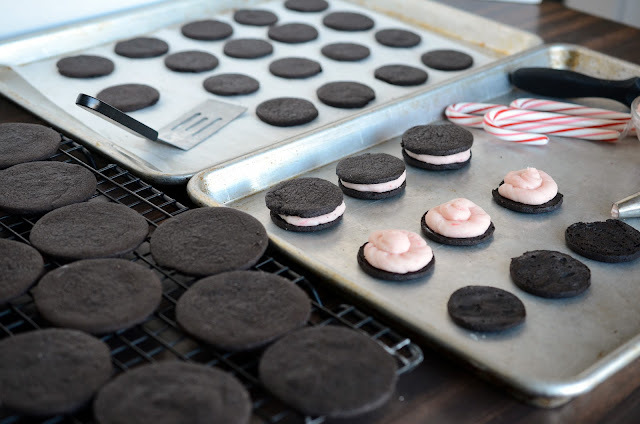 Dark chocolate Oreo cookies made from scratch. 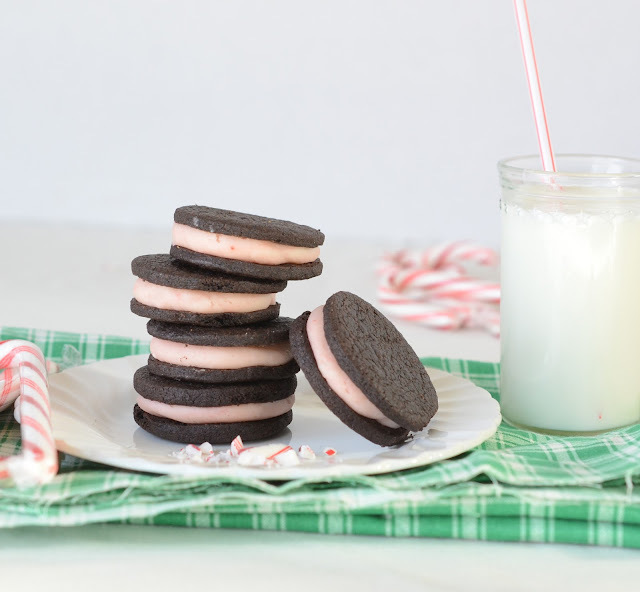 The filling is a candy cane mint perfect for Christmas. 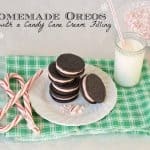 Homemade Oreos are way better than store-bought! In a stand mixer, with a cookie paddle attached, cream the butter and sugar together on medium speed until the mixture is light and fluffy, about 2 minutes. Add the cocoa powder, salt, and vanilla and mix until incorporated. Add half of the flour and mix. Add the remaining flour, 1/4 cup at a time until you get a pretty dry dough. Don’t be worried if the dough is a bit dry…we want a cookie that doesn’t spread when baked and is crispy! Divide the dough in half and pat together to form a disk. Cover the disks in plastic wrap and refrigerate for about 15 minutes. This recipe was originally published on December 6, 2012 at Honey Bear Lane. On a scale from one to ten how ready for Christmas are you? I think I’m at a 7. I am wondering approx how much crushed candy cane you used (ho many cups?). I have mini candy canes that need to be used up. These are amazing! I made a triple batch (88 sandwich cookies) and it just barely fit in my kitchen aid mixer. Everyone loved them and I crumbled the leftover cooked dough scraps with some leftover frosting…yummy! Thanks for a great recipe!